Sure enough, we checked the meta description we had set and it in no way matched what Google was showing. So, we had to look further afield. I ran a text search in Google for the exact phrase “”web design and hosting including search engine optimisation, graphic design and web promotion” to see what appeared. What we found was a link in a very old directory called Dmoz. Back in the early days of the internet, AOL created the directory at Dmoz.org to provide internet users with a human-curated, authoritative list of the best websites on the web in a huge array of categories. So, it’s a very good backlink to have. But, it being so old and authoritative, Google actually assumes that the description of your website stored in the directory is probably better than the one you have provided on your own website. We tried to contact Dmoz to have our description modified, by submitting a request using the website. But as you might expect for a very old website, we both didn’t get a reply to our request, and we didn’t get the listing changed. We use a number of different sources for this information, including descriptive information in the title and meta tags for each page. We may also use publicly available information—for instance, anchor text or listings from the Open Directory Project (DMOZ)—or create rich snippets based on markup on the page. Luckily, Google also provides a method to let them know that you don’t want your Dmoz listing used as your description. 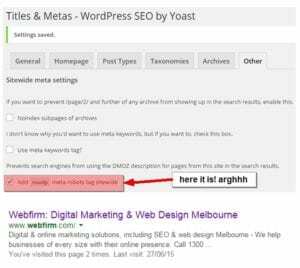 We’re using WordPress for our website, and a plugin called WordPress SEO by Yoast. The current version, luckily for us, has a feature built in to send this noodp signal to the Google robots. Under SEO and then Titles & Metas, then the Other tab, you’ll find the the setting as per the screenshot. And then, as you can see above, after the next pass of the Google bot our meta description is displaying as expected. Sound like a familiar problem for you? Feel free to get in touch in the comments and we can help you through it. Have you seen Apple’s mobile website?